Churchill dinnerware has been around for a long time. The company is well-known worldwide and can be traced back to the late-1700s. 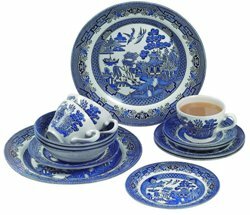 This group of dinnerware manufacturers is possibly most known amongst consumers for the Blue Willow pattern which was first introduced in the early 1800s. This lovely pattern is still in production today. The name "Churchill" was adopted in the early 1980s, shortly after they focused on manufacturing vitrified hotelware. This gained them recognition in the hospitality market as major manufacturer in the United Kingdom. Shortly after, they launched the Alchemy Fine China brand and established their brands in the United States. More recently, the Art de Cuisine brand which features Illuminate Fine Bone China, Lucaris glassware, and a cutlery brand has grown popularity. Churchill china and dinnerware has certainly gained a name in the hospitality market among professionals who desire their collections and brands such as Alchemy Fine China, Art de Cuisine, Churchill Super Vitrified, Degrenne Paris, Sola Hospitality, Lucaris Crystal, and Vicrila Glassware. 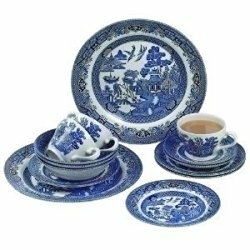 However, their current and previous dinnerware patterns are also sought out by consumers for home use, and by collectors who love Churchill's vintage dinnerware patterns. Most dinnerware sets are marked on the back for identification. The Churchill back stamp usually includes a lion which the company also uses as a logo. 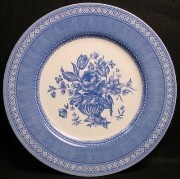 The patterns, past and present, are a lovely addition to your dinnerware collections.